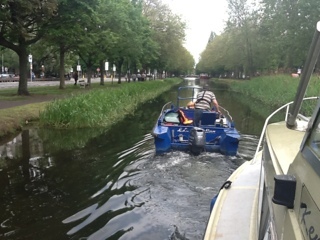 For this last kilometer or so our plan was to manually haul Kenmor boat down the canal and through 4 very close together locks to finally land in the Grand Canal Dock basin. In the Basin we knew we could find help to unwrangle our prop and propeller and be ready to cross the Liffey over to the Royal Canal tomorrow. 9:45 am, we were just about to haul the boat, as planned, but an Irish Waterways lock keeper suddenly appeared shouting not to move an inch and was quite annoyed about where we are moored. 1:45 pm, arrived at lock C4. The towing was going very smoothly. I am not sure what street lock C4 is by, but a large crowd had gathered to watch the boats. 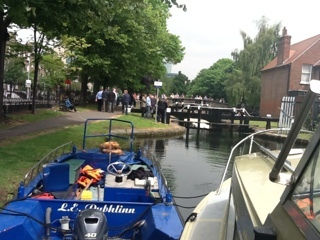 First, emerging from the lock in the opposite direction was our helpful Guinness Barge. When we entered the lock there were no shortage of hands all wanting and willing to help with lock keeping duties and action. 2:10 pm, arrived at lock 2, and here was a bit of a carnival atmosphere. 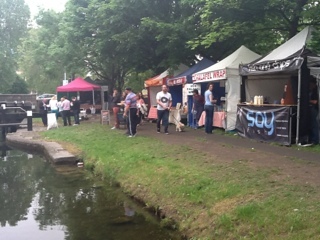 Lots of people seemingly in celebration, but I do not think it was due to our arrival, but there was an array of international cuisine stands each side of the lock gate. I would have liked to have walked back to investigate and taste some, but it did not happen due to other delightful distractions. Leaving this lock, smiles stretched on our faces as we see the final lock C1 in the distance. 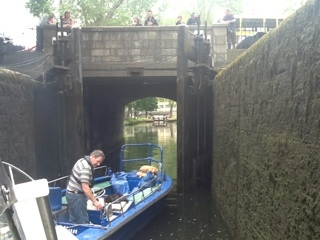 2:30 pm, arrived at lock C1, a moment of anticipation and exhileration as this is the last lock on the Grand Canal. 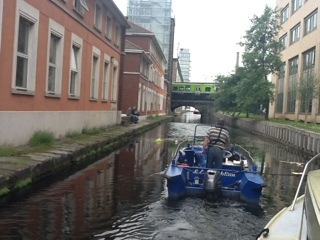 We gently cruised under a very low bridge and found the canal following beside modern buildings where there was once waterways warehouses. Though modern this area had a feel of being a Dublin Venice. 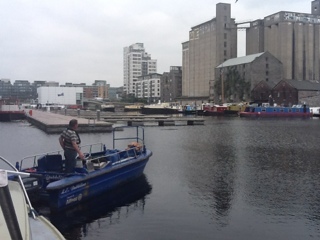 2:45 pm, arrived at Grand Canal Dock ... and the first feeling was that all of this adventure had really been worth it. There was still much to be done here as we were not an active boat again yet. No need to have worried further. A diver was waiting for us. He was quite quick to suit up, equipped with snorkel and boat owners around quickly offering various cutting tools and making suggestions. Within about 15 to 20 minutes he had cut away the entire duvet from our prop and propeller. We were relieved and grateful to hear the news that both prop and propeller looked healthy. I eagerly switched on the engine to try it out, and indeed all seemed to be running well. 3:45 pm a Facebook fan, and delightful and interesting friend of Claire's, Sheila Power, popped by to visit us. Sheila had been following this blog and my Facebook posts, and she had walked the towpath from Leeson St. trying to find us. Claire and I were delighted she could join us here in Grand Canal Dock to celebrate our arrival here with us.with us. About 15 minutes later, Mick the mechanic returned to us to offer a check up of the engine and he decided another repair needed to be done urgently. Alas, he could not complete it today. Later, In the evening, he introduced me to another mechanic who said he could complete the job on Tuesday evening. The problem is with the cooling water tank. No problems though, we set up a secure temporary arrangement to keep us going for a couple of days. 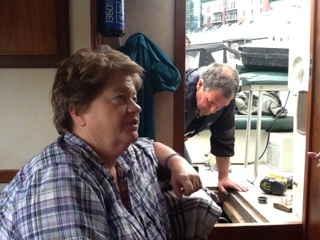 After all of this was settled, Claire had to go off on errands, including buying a diver who helped us a food parcel for his boat as he refused any payment for helping. While she was awa I took a peak at the shopping area surrounding this vast former dockland. The pic above only shows a little. There's a very tasty suppermarket there called "Fresh", that I am sure many boaters would find useful. Grand Canal Dock is a lot of luxury compared to all else on our adventure, so far, on the Grand Canal. All moorings have electric, water and boat battery charger supplies. Toilet and shower facilities are excellent and there are toilet, rubbish and recycling disposals. I am surprised there are no diesel and cooking gas supplies here, but even without that this is a fine and too underused marina. If Irish Waterways used this marina as a model to upgrade Hazelhatch, Sallins, Robertstown or Lowtown, Edenderry, Daingean, Tullamore, Rahan, Belmont, and Shannon Harbour the Grand Cana; would be a fine waterways vacation cruising canal. I was very impressed with the scenery, wildlife and many of the people we met but the downside is how the opportunities of this canal are not grasped. We have heard of Irish Waterways plans to reduce the number of houseboats, impose standards of condition they need to be in to be lived in and introduce higher permit and mooring fees. Their idea is to encourage more Waterways Tourism, attract more waterways tourism and make Irish Waterways pay for themselves. At present it is quite a taxpayer's burden. I fear their plan will alienate the canal residents, many of whom are in poor condition boats after being evicted from their homes and are unable to afford better. Evicting them from waterways would created more homelessness and a strong anger against the waterways tourism. In fact, they could end up being the ones hurling missiles at boats in locks and dumping prop busting obstacles. Many of these houseboat people know the canals better than anyone. I suggest use this and help them to build up the the Irish Waterways tourism industry while also giving them opportunity to build their trades, esteem and decent income again. A co-operation between the existing boat people and waterways management I am sure would build an incredible self paying leisure and work canal network on the Grand Canal. I hope so, I liked it there.